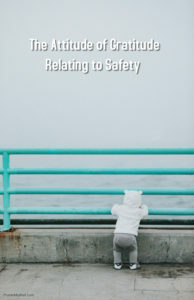 So you say what in the heck does gratitude have to do with safety? Well, you’ll be surprised! According to entrepreneur.com here are the three reasons you should adopt an attitude of gratitude. For something to change in your life, one of two things has to happen: your life changes, or you do. Waiting for life to change is a pretty passive solution. When you’re stuck in a problem mentality, you miss out on all the opportunities for solutions that are knocking on your door every day, simply because you don’t even hear them or see them. Open your eyes to a gratitude practice and all of a sudden things start to fall into place for you and your business. Being an entrepreneur means being proactive, not passive, so switch your mindset and see life change. When thinking of safety, we tend to be stuck in our ways even when there could be a more effective and a safer method of performing the job. The solution comes clear when we as a team possess a positive mindset towards finding the answers. Adopting a gratitude practice takes you out of a problem and toward a solution. It removes you from complaining mode and into a best-outcomes mindset. That’s a skill you need in your life and your business decision-making. Whole companies and industries have created from seeing solutions where others only saw obstacles. What will your contribution be? I can’t speak for you, but I don’t like being in business with jerks. I don’t like whiners, complainers or otherwise unpleasant-to-be-around people. There are too many smart, talented and pleasing-to-be-around individuals in this world for me to want to work with or hire the ones that aren’t. When you’re grateful, you tend to exude and share that contagious positive energy. People like me like that, and we tend to be drawn to you. Our enthusiasm is, and we do good things together and are better for having come together. For most employers today, the difficulty is finding the right employee, but it is not impossible. Starting with leadership, and the right management team and you will bring a contagious winning spirit to all aspects of the team! Thanksgiving is just around the corner! Spend some time thinking about how truly blessed we all are. If your company has a robust safety program with zero accidents by all means give thanks and celebrate those accomplishments with the team! If your safety program has opportunities the team may have many ideas to bring the program to the next level. Be positive, engage the workforce and be thankful! Allow those around to succeed!